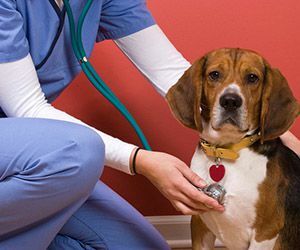 First, get clearance from your veterinarian that your dog can physically handle the sport. Biking may be too strenuous for older dogs and those with health conditions such as heart disease or arthritis. Young puppies whose musculoskeletal development isn't complete shouldn't run beside a bike, because the impact can injure growing bones and joints. Your vet will tell you whether the sport is appropriate for your pup. It's essential to use a special leash designed for dog-biking, rather than simply holding your dog's regular leash or attaching it to the seat post (both of which are highly unsafe). Dog-biking leashes are designed to keep your pup safely off to the side, so he doesn't bump into the bike, while allowing you to keep both hands on the handlebars. Many popular dog-biking leashes such as the Springer and Walky Dog Plus also have a coil spring mechanism that absorbs the shock should your dog suddenly lunge for a squirrel and give the leash a tug. 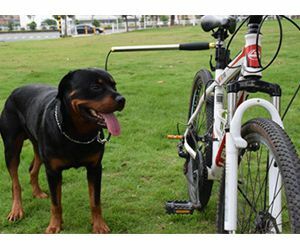 Start out by attaching the dog-biking leash to your cycle and letting your dog sniff the apparatus. Once she becomes familiar with the leash, fasten her to it, while praising and rewarding her with a treat. The idea is to get her to associate the bike and leash with a pleasurable experience, so it's important to use a treat she'll find absolutely scrumptious. We suggest Crazy Dog Organic Train-Me! Treats, made with real, fresh organic beef or chicken. When your dog becomes comfortable on the leash, start "walking" the bike around the neighborhood while he's attached to it. After practicing this exercise for a while -- with plenty of praise and rewards - you're ready to ride. While staying in a traffic-free zone (sidewalk, empty parking lot etc.) 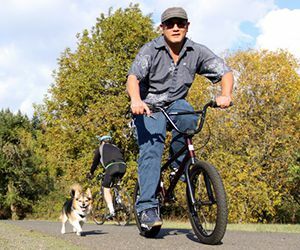 hop on the saddle and start pedaling slowly so the pace isn't much faster than when you and your dog were walking the bike. Gradually increase your speed - and you'll be running and riding together in no time. 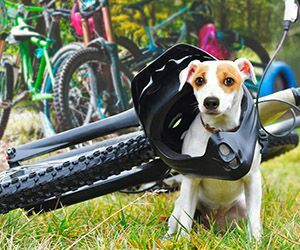 As your dog becomes accustomed to biking, you can travel longer distances and over more challenging terrain. Always be mindful of your pet's health and safety. Have her wear a bright, reflective vest when biking at night. Bring along a water bottle and take hydration breaks. During these rest stops, inspect your dog's paws for cuts and scrapes. Keep a first-aid kit in your saddle bag with items like bandages and antiseptic sprays. 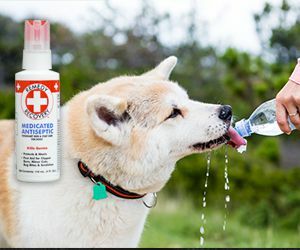 You can find a good selection of first-aid products made specifically for dogs at Remedy+Recovery. Happy trails!